Carlisle Truck Fest (August 5-7) is the perfect chance for you to haul in to one of the largest and most action-packed truck events in the world. 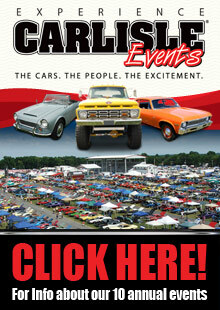 The Carlisle Truck Nationals is a must-attend event and has been epicenter for all things truck since 1991. Check out the lowered mini trucks, lifted 4x4s, chromed out big rigs and the perfectly restored classics at the event that celebrates the truck hobby. Annually more than 2,000 trucks are part of the judged Showfield but more than judged excellence, there is something for the entire family to enjoy. Kids and adults alike can enjoy monster truck shows featuring Megasaurus, Virginia Giant and War Wizard plus climb in for a monster truck ride around the grounds. The family fun continues with the Kids at Carlisle Activity Center, shopping, parts buying at the Manufacturers Midway and much more. In addition to the family fun there will be a tailgate competition with prizes awarded, celebrity guests including Brian Fisher, Kevin Tetz and Susan Parker as well as a chance to see what your truck is made of on the Axcelerated Motorsports Dyno machine. Now who don't love attending a Truck Fest. Thank you for reminding us about the Carlisle Truck Fest in August. Carlisle sure knows how to keep-em-coming back for more.